View More In Beer Mugs & Steins. The classic beer mug beautifully engraved makes a great gift. Enjoy your frosty ale or lager in style! Etching is permanent and the glasses are all dishwasher safe! Great for wedding parties, housewarming gifts, groomsmen gifts and much more! Holds 12 oz. 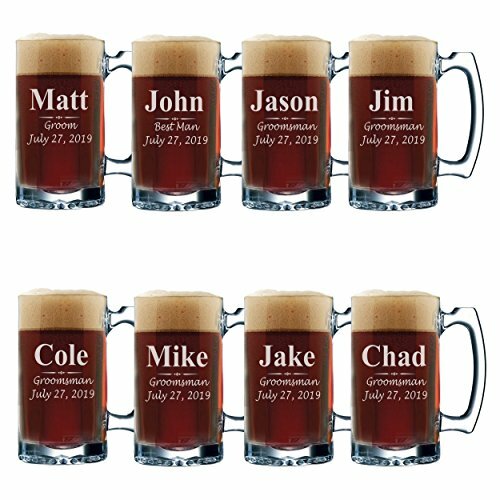 FREE ENGRAVING - Customize with names, wedding roles and a date. And the price per glass automatically discounts the more you buy. 100% SATISFACTION GUARANTEED - Contact us and let us know if you have any questions - Your satisfaction is our TOP priority! If you have any questions about this product by My Personal Memories, contact us by completing and submitting the form below. If you are looking for a specif part number, please include it with your message.